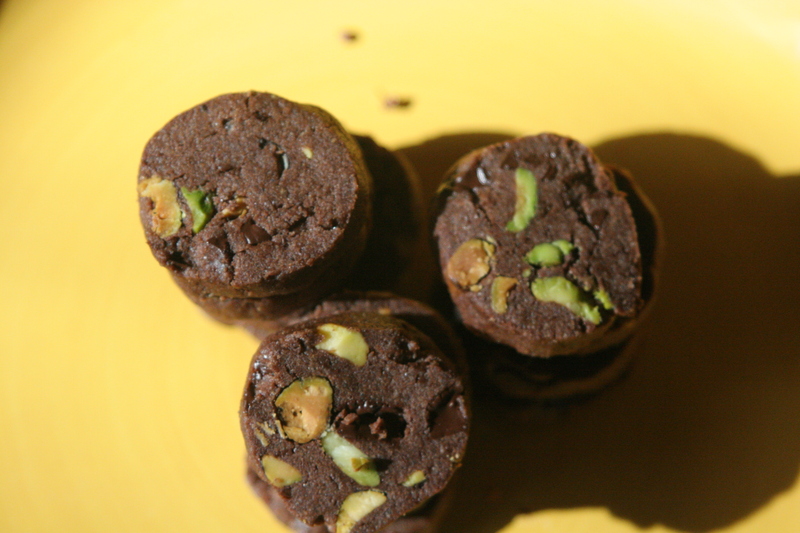 Imagine a tiny dark chocolate cookie with 70% chocolate chunks, roasted pistachios, and delicate, barely there crystals of sea salt. It contains no eggs so it is actually a lot like a chocolate shortbread–just on this side of crunchy while maintaining a slight softness and density of crumb in the middle. These are terrific cookies. I roll the logs of dough extremely thin, about 1 1/2 inches in diameter, so that I can eat tons of them without feeling bad about stealing them from everyone else. As I have mentioned before, I am adamant that nuts must be pre-toasted before mixing into baked goods. They take on a really fragrant, enhanced flavor of (in this case) pistachios, one of my favorite nuts. For me, pistachios are redolent of the Arab Mediterranean and Sicily, usually with rose-water or orange flower water in desserts (more on a phenomenal meringue cookie with those flavors to come). Pistachio gelato, pistachio macarons, pistachios in salads. I cannot get enough of them. They really sublimate the taste of this cookie. Finally, my favorite thing about this recipe is that you can keep it in the fridge for a couple of months rolled into logs and wrapped tightly in plastic wrap. That way whenever you have a craving for freshly baked cookies or need to give a gift to your sweet neighbor whose Australian Shepherd has passed away (sigh…. ), you have some ready to go. What are your favorite cookie ingredients? Best response wins my attempt at creating your cookie for you. Enjoy! P.S. I apologize (kind of) for the butter and cream overload in the last two posts. As penance, keep an eye out for a tasty Moroccan inspired vegan soup to help you transition from winter to spring in my next post. 1. Sift together the flour, cocoa powder, and baking soda. 2. In a standing mixer with a paddle attachment, beat the butter until it is fluffy. (You can do by hand, of course.) Add both sugars and beat for another minute. Add vanilla extract and salt and beat one more minute, scrapping down the sides. 3. Carefully pour in the sifted dry ingredients and beat until the dough just pulls together and looks crumbly. 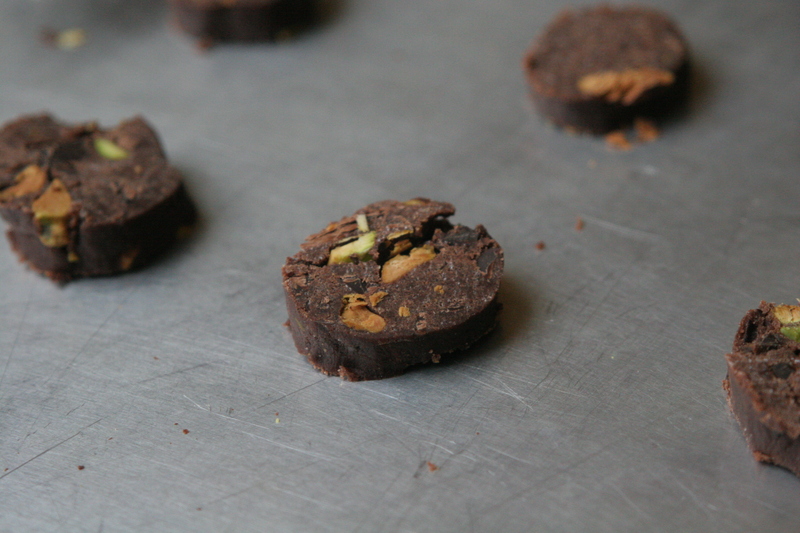 Add the chopped chocolate and pistachios and beat for another 15 seconds until just incorporated. You will not have a mass of traditional-looking cookie dough. When you squeeze some together in your hand it will clump together. This is right. 4. Take a big lump of dough and begin squeezing it together to form a log. I like to make them very thin–about 1 1/2 inches in diameter if you slice them into rounds. I find that squeezing works better than rolling it out on the counter with your hands play-dough style where it falls apart. You can make several smaller logs and freeze them separately or just two longer logs of dough if you plan on making bigger batches. Wrap logs of dough in plastic wrap and freeze for a minimum of 40 minutes or up to several months. 5. To cook, preheat the oven to 325 F. If you have parchment, use it. Some cookie sheets are better than others. No worries if you do not have any. Slice the cookies about 1/4 inch thin, space them out on your cookie sheet. They do not need that much room. Cook for 8-10 minutes, turning sheets 180 degrees and switching top and bottom sheets half way through the cooking. They will not look quite done since they are a butter based cookie, but that’s alright. Let cool completely. I never can resist eating a couple before the chocolate chunks have melted, but this is one cookie that is superior after it has cooled just a bit. Store in a closed container. *Note: I have also had great success with natural unsweetened cocoa powder, especially Valrhona’s, but I like to cook them just a bit less because I feel that their more delicate flavor becomes obscured with the cooking time written as is. 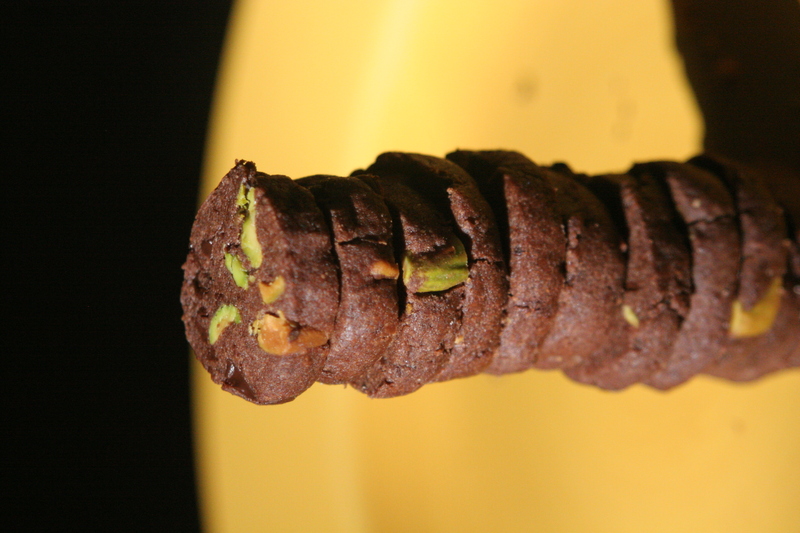 This entry was posted in Chocolate, Cookies, Pistachios and tagged chocolate pistachio cookies, dark chocolate pistachio cookie recipe, salted chocolate cookie recipe. Bookmark the permalink. I can’t wait to make these cookies. Everything you post and the way you write about them makes me want to make them immediately. Since you asked about our favorite ingredients, I might as well tell you about my latest challenge. While in New York, we stopped at Momofuku Milk Bar numerous times for Christina Tosi’s ingenious creations. We sampled one of every kind of cookie she makes and the wrapper lists the ingredients. I’ve already re-created her Compost Cookies through the help of numerous versions online, but this weekend I’m going to try and make her Corn Cookies. The ingredients are sugar, butter, unbleached wheat flour, corn powder, corn flour, eggs, salt, baking powder and baking soda. Thanks Laurie. Those cookies sound amazing! I am going to post a really good cornmeal cookie soon too. I use Full Belly Farm’s stone ground cornmeal and it is transformative. I have made a few fruit galettes with cornflour and I have used it in some tasty waffles, but never in cookies. Do you think that Tosi separates the eggs since cornflour is a little dense? I.e. do you think she uses just egg yellows? My cornmeal cookie recipe only uses yellows. As for the compost cookies, I have also made a couple renditions of those with potato chips and chocolate. They were good, but I felt I need to work on them a bit more. I wasn’t a fan of the corn syrup in the recipe I used. What recipe did you settle on for those? Here is a link to the recipe I ended up using, http://rainydaygal.com/?p=1977. Next time, I would limit myself to two kinds of baking ingredients and two snack foods. My original recipe suggested the following mix ins: chocolate chips, raisinettes, rolos, cocoa krispies, toffee nuggets, butterscotch chips, potato chips, pretzels and rice krispies. We made these before trying them in New York and they were very similar. My son Matt made her Crack Pie over Christmas break and that tasted very similar as well. OK, I will give them another try. I too, have been wanting to try the Crack Pie. I have the Momofuku cookbook and it has a few of Tosi’s recipes, but I haven’t done any of them. Steamed pork buns first. I had to suppress the strong urge to lick my computer screen. Those cookies look heavenly! Re: favorite cookies ingredients, I’m old school and am a sucker for a cookies with oatmeal and raisins/currants! Have you tried Anzac biscuits? really crubly and delicious. I know of them, but I have never made them. Do you have a preferred recipe? I don’t have a favorite ingredient, but I would appreciate it if someone would come up with a graham cracker that actually tasted good. And maybe a fair recipe for homemade marshmallows. And maybe…well, you get the picture. Oh how I wish I could make these for my kids…they sound wonderful. You know our list of ingredients, and I think it’s a pretty unfair challenge. No dairy, no soy, and preferably no eggs; we have a favorite cupcake recipe that we’ve been using for three years, but number one does not like sweets at all (only kid at his birthday who took only two bites of his cupcake), and number two is headed in the same direction, so I’ve never been inspired to find a great cookie recipe that works. These cookies are incredible! Also, what a bonus to be able to slice a few off the stashed frozen roll whenever the urge strikes. My husband promptly judged these the best cookies he’s ever had. I am so happy Michael introduced me to your blog – – everything I’ve looked at calls to me. Thanks! Yes, with these cookies, the urge strikes a lot! More sweet goodies to come. Ok I followed the recipe to a t and it was a disaster. I bought expensive pistachios and use my best valrohona chcolate. So disappointed. Too bad. How did they go wrong? I actually made these again last night as part of my holiday cookies.